Today is cold. After an unseasonably warm September here in Winnipeg, October seems to be making up for lost time. If you had to work outside like I did, your prime directive was to stay in the sun as much as possible. Soon even that won't be warm enough. I'm not complaining... Winnipeg wouldn't be Winnipeg without six months of extreme cold every year. 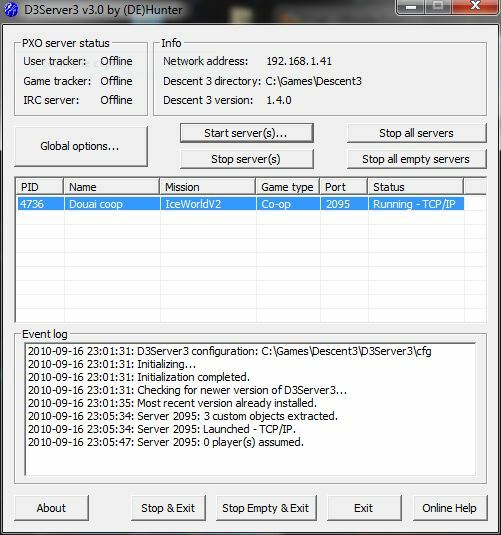 The new version of the Descent 3 dedicated server tool D3Server3 can run as a Windows service. This means that no user needs to be logged on to the system, and all dedicated servers can run entirely in the background. This also means that you can set it up to automatically start up when the system is turned on or restarts and that you can configure a recovery strategy in case it fails. By and large, all benefits of a Windows service apply to your server tool and the dedicated Descent 3 servers it controls. Are you still compressing and archiving your data as zip files? In that case you might want to have a look at 7-Zip. Not only does 7-Zip compress better. The free open-source product comes with a complete file manager, command line utility, and documentation. FileZilla is a very handy and free FTP client, probably the best out there. One of its features is to provide an option to remember the passwords used for FTP connections. It goes without saying that the passwords are stored encrypted. But what if you need to retrieve one of them again? For that purpose, Andrea Giammarchi has developed the Filezilla Password Recover software. He offers it for free. The unoffical version 1.5 patch of Descent 3 fixes many bugs the 1.4 version contains. This would be pretty nice if it didn't introduce many additional bugs that outweigh its benefits again. That's why most pilots still run 1.4. Now there's no reason anymore to stick with just one of these two Descent 3 versions. The Descent 3 Version Switcher is a little utility that lets you switch between both versions, 1.4 and 1.5. It contains the files that are different between those versions and applies them according to your selection. This may be of importance for Descent 3 players who have downloaded the Descent 3 version from Dateiliste. Jayman has noticed that our Descent 3 installation program didn't contain the intro movies for Descent 3: Retribution. It only contained the movies for Descent 3: Mercenary. This was of course a bug and has been fixed in the current release. Virus scanners are software developed and configured by humans. As it is with all software, every virus scanner has bugs, and every virus scanner reports certain files at some point as being infected with a virus, worm, trojan, or malware. This is unfortunate inevitable fact.